Sandwich fans have two pieces of card stock folded on top with the stick sandwiched in between. Both sides of the sandwich fans are liquid laminated for high gloss finish. Sticks are glued (not stapled) for safety and for a clear message on both sides. 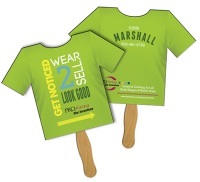 Sandwich fans are high quality 22 point paper board, for a total 44 point thickness. 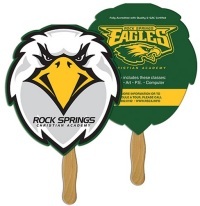 Full imprint area is available on these two sided fans, front & back. Multi color imprint available. Approximate size 8″ by 9″ with out handle. An additional $35 per color non-refundable artwork charge is due before work can begin. Add an additional $45 charge for logos and/or photos. Please provide acceptable artwork to avoid additional art charges. Production time approx. 2 weeks. Select from Standard PMS Colors below. Two sided stock shape sandwich fans are folded with stick sandwiched in between. Both sides are liquid laminated for high gloss finish. Glued stick handles (not stapled) for safety and a clear message on both sides. Sandwich fans are high quality 12 point paper board, for a total 24 point thickness. Full imprint area on two sided fan, front and back. Digitally printed in full color. An additional $35 non-refundable artwork charge is due before work can begin. Add an additional $45 charge for logos and/or photos. Please provide acceptable artwork to avoid additional art charges. All shapes shown below are available for digital printing except air balloon, broom, light bulb, truck or butterfly. 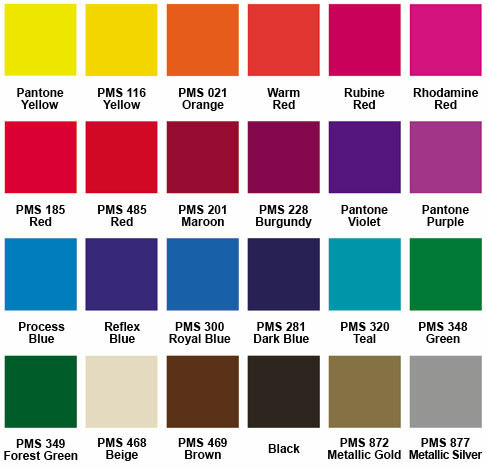 Standard PMS Colors: No additional charge for standard colors shown below. Custom PMS Color Match available for $20.00 per color. Please provide PMS color # when ordering. Select a Shape: We offer the following stock shapes for the same low price. All shapes shown below are available for offset printing.